The broken foot belongs to our esteemed Web Editor Carl Hall. While there’s cause for empathy, there’s no cause for alarm. Carl Hall is young and tough (aside from brilliant) and his broken right foot is, as they say in Swahili, well on-the-mend. True North is also young and tough and with growing financial support there lies a bright future ahead to keep you informed and entertained. — 446 words. War loser president George W. Bush made a desperate visit to Africa recently paving his way with gold through five safe countries. — 668 words. "We must ensure that all life is treated with the dignity it deserves," President Bush declared during his final State of the Union address. He then segued into a call to ban human cloning. He didn't talk about dignity in terms of ravaged pensions, working longer hours for lower wages, and the loss of healthcare and other benefits. He didn't talk about dignity in terms of the rise in poverty — 37 million Americans, one in eight citizens now living below the poverty line in the wealthiest nation in the world. And he certainly didn't talk about dignity when it comes to migrant workers in Immokalee, Florida where — as Senator Bernie Sanders told me just days before Bush's SOTU — "the norm is a disaster, and the extreme is slavery." — 2,040 words. Canada has been scientifically healthy. Not so its government. — 677 words. OTTAWA (CP) - Jean Chretien says Canada should proceed with caution as it considers recognizing Kosovo's independence. The former prime minister toyed with journalists Friday after receiving the Order of Canada, playfully evading questions about current events - but he stopped joking when the topic turned to Kosovo. Chretien described the situation in the Balkans as a political powder keg with far-reaching implications. And he appeared to back the go-slow approach of the Harper government, which is taking its time and has not yet followed the lead of many other countries in recognizing Kosovo. — 758 words. OTTAWA — Canada's largest commercial television network is asking for the immediate release of an Afghan employee who it has been told is being detained by the United States military. Robert Hurst, the president of CTV News, said Javed Yazamy, who performed a variety of reporting and support duties for the network in Afghanistan beginning about two years ago, disappeared in the city of Kandahar last October. Mr. Hurst said the International Committee of the Red Cross subsequently confirmed that Mr. Yazamy, 22, was in the Bagram Detention Center at an American air base near Kabul. — 466 words. Iran, the world's fourth-largest oil producer, may use the ruble in trading on its new oil exchange, the country's ambassador to Moscow said Friday. "Big energy producers like Iran and Russia should try to free the world of dollar slavery," Ambassador Gholamreza Ansari said on Ekho Moskvy radio. — 291 words. The war in Afghanistan is one of ideas and ideologies. Ideologies, in that the Pashtun extremist worldview is far from our own. Ideas, in that our society is likely to prevail only if it makes wiser and cleverer decisions than theirs. That is why, when one adds up Canada's advantages in this war, there is none greater than our values of inquiry and debate. — 892 words. WASHINGTON (Reuters) — The U.S. military has been stretched dangerously thin by the Iraq war, according to almost 90 percent of retired and current military officers polled on the state of America's armed forces. Eighty percent said it would be unreasonable to expect the U.S. military to wage another major war successfully at this time, according to the poll by the Center for a New American Security think tank and Foreign Policy magazine. — 323 words. ‘The problem for the administration in Washington is that many of its European allies are very cautious about closer involvement with what is essentially an American war in south west Asia, and are especially cautious about a war that might extend to Pakistan.’ — 2,506 words. ‘So it's no surprise that we're now seeing ethanol advocates (those interested more in the business and investment opportunity instead of a campaign contribution), salivating over the possibility of gaining access to Cuba's robust sugar crops.’ — 833 words. WHEN people one day look back at the remarkable implosion of the Hillary Clinton campaign, they may notice that it both began and ended in the long dark shadow of Iraq. — 1,552 words. Is masculine Hillary losing to feminine Obama? If this is truly the Decline and Fall of the Clinton Empire, it is marked by one freaky stroke of bad luck and one striking historical irony. — 779 words. — What do the initials CMHC stand for? I've been watching cable news all morning and one of the things that strikes me is that they don't seem to grasp what the McCain/Iseman story is about. If this was just about Botox McCain getting lucky with some skinny lobbyist the campaign would probably be delighted to have it in the headlines to combat the "he's too old" meme that's gathering steam. It's not. It's about his relationship with a telecom lobbyist who boasted about her ability to professionally influence him in business situations, and whose lobbying interests McCain has taken clear action to help. — 1,476 words. The Canada Border Services Agency must walk a fine line between enforcing the nation's "customs tariff" that prohibits the importation of any materials "deemed to be obscene" and running afoul of constitutionally protected freedom of expression set out in the Canadian Charter of Rights and Freedoms. — 220 words. TEHRAN -- Iran has begun importing 1 million cubic meters of gas per day from Azerbaijan, an Iranian news agency said Monday, in an apparent move to help compensate for shortages caused by a cut in Turkmen deliveries. — 147 words. The Revolutionary Armed Forces of Colombia (FARC) will release "within days or weeks" four Colombian ex-legislators who have been held hostage for as long as five years, the French Foreign Minister Bernard Kouchner announced after meeting Wednesday evening with Venezuelan President Hugo Chávez in Caracas. — 784 words. LONDON (Reuters) — Mongolian commodities and Ukrainian banks may be the key to weathering the global investment storm, says Eurasia Capital Management, but steer clear of Russian property shares. — 250 words. car three years from now? That's a tough question, you might say. After all, we will still be relying on traditional gas-powered vehicles for many more years. Yet, that's not going to stop the folks at General Motors, especially those at the Chevrolet division, who entertain high hopes of seeing electric vehicles on the road in the near future. — 813 words. The Feb. 20 shoot-down of a toxic-fueled satellite was an amazing technical accomplishment. Think of it: An SM-3 missile, fired from a cruiser in the Pacific Ocean, ascending 133 miles and colliding dead-on with an object the size of an SUV that's zooming through outer space at 17,000 miles per hour. Truly remarkable! But does it say much, as some have claimed, about our ability to shoot down ballistic missiles fired at American (or allied) shores by a nuclear-armed enemy? Not really. — 1,117 words. 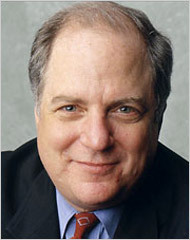 WASHINGTON — A former Republican campaign worker claims that President Bush's former top political adviser, Karl Rove, asked her to find evidence that the Democratic governor of Alabama at the time was cheating on his wife, according to an upcoming broadcast of "60 Minutes." — 422 words. MOSCOW — Liberal Democratic Party candidate Vladimir Zhirinovsky attacked his rival during a televised debate, Kommersant reported Thursday. — 169 words. Andre Breguet is considered the father of watches and his watches today fetch unbelievable prices ($750,000). He gave a silver watch (1790) to Marie Antonette, the hated 'Austrian' Queen of France. — 137 words. Montreal-born Valerie Knowles has a B.A. (Honours History) from Smith College, Northampton, Massachusetts, an M.A. from McGill, University, Montreal and a B.J. from Carleton University, Ottawa. 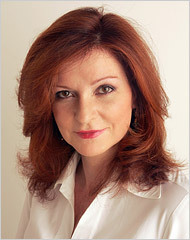 She now resides in Ottawa, where she writes for newspapers, magazines and Canadian federal government departments. This Canadian writer has published nine non-fiction works, three of which are trade books. One of these, From Telegrapher to Titan: The Life of Wlliam C. Van Horne (Dundurn Press, 2004), won the University of British Columbia Medal for Canadian Biography for 2004, the City of Ottawa Non-Fiction Award for 2005 and the Canadian Railroad Historical Association Book Award for 2005. 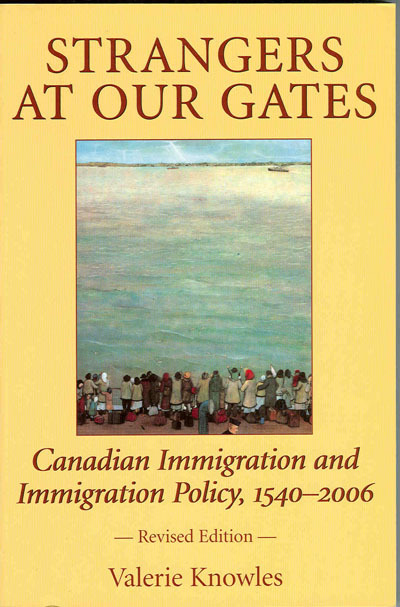 Her book, Strangers At Our Gates: Canadian Immigration and Immigration Policy 1540-2006 (the third edition of this immigration history) has been described as a "standard reference tool and the textbook of choice on the always controversial question of which, and how many, people should be allowed into Canada." Michael Molloy, President of the Canadian Immigation Historical Society. (Please click here for more). Harold Wright, Doctor of Punology, and his colleague George Carlin succinctly deal with profound questions of life and living: Why is a person who plays the piano called a pianist but a person who drives a race car not called a racist?